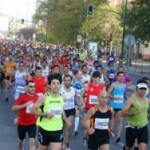 Half marathon Cuenca City and a 10K is a beautiful race that runs through stunning landscapes. As a starting point we are in the area of ​​the Castle, the highest part of Cuenca where you can see the Hoz del río Huecar, and then go to the Hoz del río Jucar. In a very beautiful autumnal landscape where you can see people doing climbing or canoeing. It is not only a half marathon, come and enjoy it. We are looking forward to hearing from you.